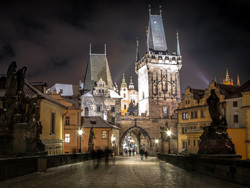 Experience one of the most beautiful cities in Europe with a Czech course in Prague! After your Czech lessons, enjoy lunch under the gaze of the striking Church Of Our Lady Before Týn, in the Old Town Square. Then browse exclusive shops in monument-laden Wenceslas Square, before taking a stroll across Charles Bridge to the majestic Prague Castle. The Czech capital has history around every corner, with museums dedicated to everything from Communism to Fine Art throughout the ages. For some lighter entertainment, Prague’s vast collection of bars, late-night cafés and clubs offers every type of music imaginable. You can always recover from the night before in one of the many oases of green parkland dotted around the city. If you learn Czech in Prague, you’ll soon realise that this is a city with a thousand different faces! We offer Czech courses in the Teacher’s Home, giving you the complete immersion and individualised tuition you need to learn Czech quickly! You can tailor your private Czech lessons to precisely meet your needs, and perfect your language skills as you chat with your teacher after class. Our school will strive to find a teacher who shares your interests, giving you more to talk about and helping you settle in. Choose 10, 15, 20, 25 or 30 sessions per week for your Czech course in Prague. Our school only works with the friendliest native Czech teachers, so you can be assured of a warm welcome to the Czech Republic! They’ll provide you with a comfortable single room, as well as three home-cooked meals each day. Your teacher will also organise at least five extra-curricular activities per week for you, giving you even more opportunity to practice your Czech! Typical activities include guided tours of Prague, museum trips and dinners out with your tutor. See more of the Czech Republic and its vibrant culture as you learn Czech in Prague! Prague Ruzyne Airport, which is a destination for airlines across Europe, is located 10km outside of the city centre. For a supplementary fee, your teacher will pick you up from the airport and take you directly to their home.